For many years Brocklehurst's London offices were located in the shadow of the Cathedral. The main silk trade flourished in this area and from where Spitalfield designs originated and enjoyed world fame as did the many silk houses and export companies, many being members of the Worshipful Company of Weavers. 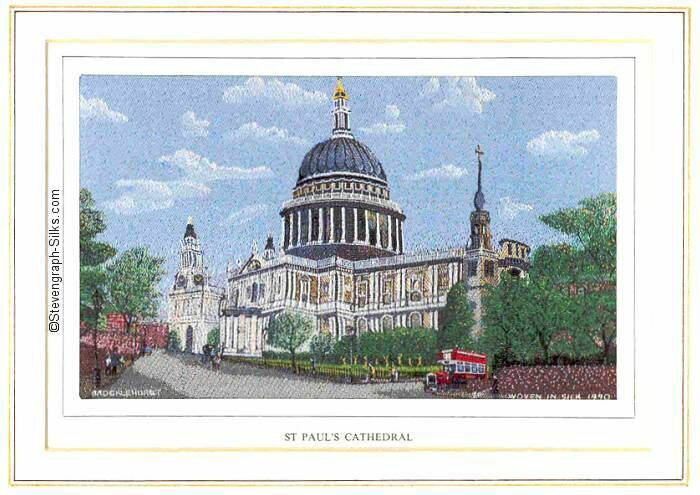 ST PAUL'S CATHEDRAL was chosen as the subject for the 1990 picture. At first sight this appears to be one more with no perceived connection with Macclesfield, but the legend reveals all. The main silk trade flourished in this area and Brocklehurst's London offices had been located close to the Cathedral for many years.